UNITED NATIONS, September 20 -- The UN World Food Program's activities in Somalia, portrayed critically last week by the Wall Street Journal and defended by the BBC, bear a closer look. The Wall Street Journal ran a belated story on U.S. and UK concerns that some of their funding of WFP is running off to the Al Shabaab rebels. Inner City Press followed up, asking top UN humanitarian John Holmes about the allegations. Holmes, like the BBC, pinned them on the U.S., not his native UK. Video here, from Minute 28:26. The BBC ran a piece saying that U.S. sanctions are leading to starving children in zones that are rebel controlled. Inner City Press' Somali sources, too, say that the U.S. and UK are playing the politics of food, trying to starve out those who live in Shabaab controlled areas. They wonder why the UN's Ban Ki-moon has said nothing about this. But now sources tell Inner City Press that the World Food Program, in part to counter U.S. concerns and also to serve U.S. policy, has hired mercenaries, "Blackwater" it is said. The sources go further, saying that the stated size of WFP's program in Somalia cannot be verified with real food purchases, that some portion is just cover for funding mercenaries' training of militias supportive of the Transitional Federal Government. These sources say this is not the first financial shenanigans by WFP, that much of WFP's appeal for funding is to cover a "black hole" in WFP's past budget, money borrowed in expectation of pledges. Meanwhile, as Inner City Press has reported, WFP chief Josette Sheeran spend some $400,000 dollars to have children from Ghana flown in for a "simulated feeding program" for the spouses of G-8 leaders at the meeting in Italy. Click here for that. Clearly, Josette can get her message out through BBC. 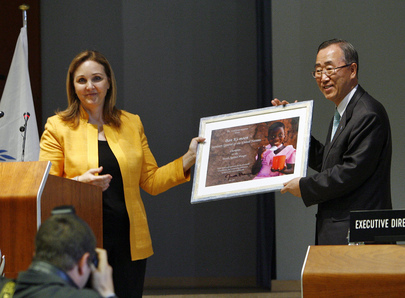 But why wasn't she included, as UNICEF's Ann Veneman was, in Forbes' list of most powerful women? Watch this site. UNITED NATIONS, September 16 -- Amid allegations that UN aid funds are being diverted in Somalia, leading to reported threats by the United Kingdom and U.S. to cut or condition their funding, Inner City Press on Wednesday asked top UN humanitarian John Holmes what the UN is doing. Holmes said that the World Food Program has begun an internal investigation, and that he doesn't know how long it will take. He said it is mostly the U.S. that is concerned -- others name the UK first -- and that other donors just keep on giving. He said there is little choice but to continue. Video here, from Minute 28:26. Since the allegations focus on particular trucking companies that are being used, and their links to entities on anti-terrorism lists, Inner City Press asked Holmes what is being done about this, since such diversion would violate, in some cases, legal prohibitions. Holmes said that WFP is diversifying the number of trucking firms it works with. He did not address the legal question. (As reported earlier today, the UN's top legal refuses to answer questions other than on the narrow topics for which she appears for press conferences: today, the UN Treaty Event). In a sense, there is not a contradiction between taking seriously and acting on these allegations of diversion of funds, and wanting the programs to continue. In fact, diversion leads to a lack of credibility, and ultimately hurts the programs' beneficiaries more. Merely referring problems to internal investigations, the time frame of which knows no limits, also hurts the UN's credibility, as has happened this summer in the months old investigation of the head of the UN's Congo Mission Alan Doss asking the UN Development Program for "leeway" to hire his daughter. It was relegated to an internal investigation, and nothing has been done. When during the summer's G-8 meeting WFP spent $400,000 to fly in children from Ghana for a "simulated feeding demonstration" for the G-8 leaders' spouses, neither Ban Ki-moon nor John Holmes for OCHA said there was anything wrong with this. 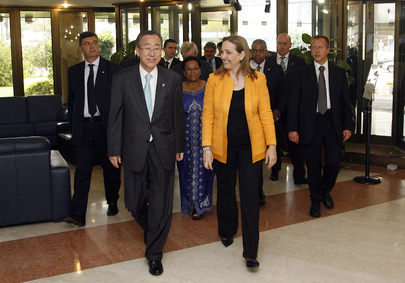 This too undermines confidence in the UN, including by donors. Note: There's other things going on beneath this WFP corruption story, Inner City Press' Somali sources say: the use by the US and, contra Holmes, UK of food as a weapon, embargoing or problematizing food aid to areas controlled by Al Shabaab. As one source puts it, "to kill the fish, you have to drain the water, right?" We will have more on this. UNITED NATIONS, September 15 -- The UN, which nearly invariably uses as a defense against inaction on human rights abuses that only works in countries upon invitation, views Somalia through a different prism, it seems. How else to explain the dismissive response of the head of the UN's Department of Political Affairs, Lynn Pascoe, to questions that have arise about the work of UN envoy Ahmedou Ould Abdallah after his Norway-funded, Kenya-drafted Law of the Sea filing about rights to Somalia's continental shelf was roundly rejected by Somalia's parliament? Inner City Press asked about that, and other questions that have arisen about the legitimacy of the multinational naval presence off Somalia's coast under a UN Security Council resolution based on a letter signed right at, or past, then President Yusuf's last day in (appointed) power. Video here, from Minute 1:05. Pascoe replied breezily that Ould Abdallah is so "activist" that it is not surprising that some people don't like it. But if those people include the majority of Somali parliamentarians, isn't that a problem for the UN? Pascoe replied that the former President -- presumably Yussuf -- really wanted the UN in the country. To paraphrase Pascoe about surprise, it is not surprising that rulers who have never been directly elected by the people welcome outside forces which treat and support them as legitimate. Some Somalis were found, as a fig leaf, to invite in the Ethiopian forces in 2006. 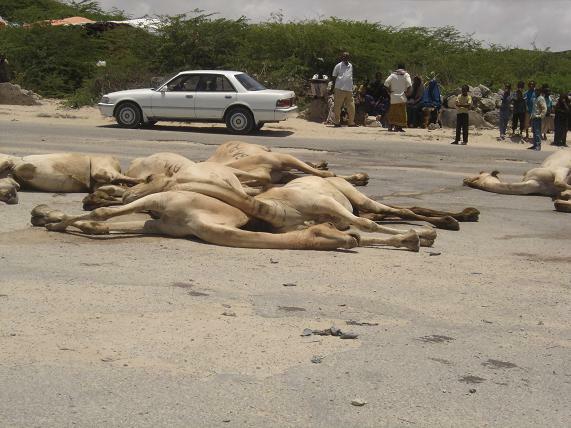 Recently, the AMISOM force which took over from the Ethiopians mistakenly shot and killed a group of camels just outside the barbed wire fence around Adan Ade airport in Mogadishu, mistaking them for "insurgents." AMISON's spokesperson, Barigye Ba-hoku, told the press that "It was our new forces and they were not aware of the camels’ movements. They say they were attacked, and so opened fire,"
Inner City Press has asked the UN what its role with AMISOM is, whether it provides ammunition and training, and what it thinks of the camel killing incident. Watch this site.